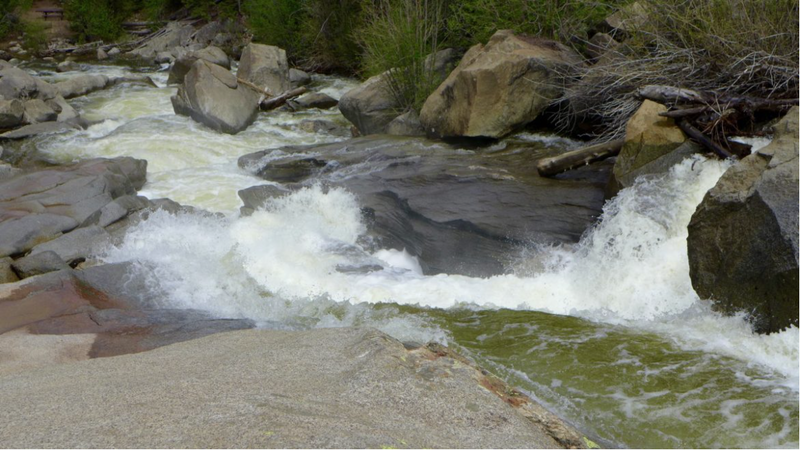 Roaring Fork River, Grottos, on Monday morning June 13, 2016, looking downstream, with diversions into the Twin Lakes Tunnel at over 600 cfs. While impressive at this level, the whitewater frenzy that resulted after the tunnels were closed was far more intense. Photo Brent Gardner-Smith Aspen Journalism. Healthy Rivers and Streams board members recently took a field trip to the construction zone on the Roaring Fork River, where backhoes are digging up the riverbed. By February, this should be a man-made whitewater park with two waves for boaters to surf. Board chair Lisa Tasker said the ultimate goal of this project is to keep water in the river during low flow years, using a water right designated for recreation. “When you get a recreational in-channel diversion water right, you have to put structures in, and then you have to prove that people are recreating in there,” Tasker said. Now it is turning its attention to the City of Aspen, which wants to reserve the right to build reservoirs on Castle and Maroon creeks. The municipality filed last month with the state to keep its conditional water storage right. At a meeting in late October, the river board agreed to urge Pitkin County Commissioners to formally file in opposition to the City of Aspen in water court. Commissioner Rachel Richards is not warm to the idea. “Just forcing the city to relinquish those water rights actually does nothing to protect the long-term health of the Castle Creek or the Maroon Creek,” Richards said. Richards said she’d like to see the city maintain the rights while researching alternatives, like digging into a deeper aquifer or working to change Colorado water law entirely. If nothing else, Richards and Tasker agree, the issue has opened a new conversation and interest in local water issues. “I think it’s going to cause people to become a lot more creative and a lot more imaginative as to how they’re going to handle a shortage of water in the future,” Tasker said. The county has until Dec. 31 to file in opposition to the city. Read Brent Gardner-Smith’s analysis of Aspen’s diligence filing.